Counter Snap / Squeaky No More for Wood Floors is a squeaky hardwood floor repair kit specially designed to eliminate annoying squeaks in hardwood or softwood floors and stairs (not recommended for parquet flooring). While the screws can be used in the field (between the joist) and at the joist, the screw's length once the head snaps off is only 2 inches. The 1/8-inch diameter screws with 3/16-inch coarse threads provide the holding power of a screw with an easy-to-conceal hole the size of a finish nail. Specially scored, the screws are installed through a center hole in the Counter Snap Fixture using a power drill with a #2 recess square driver bit. When the head of the screw hits the top of the fixture, the top 1-inch portion of the screw snaps off at the score, leaving 2 inches of the threaded portion of the screw countersunk 1/8 inch below the floor's surface. For a hardwood floor application, I recommend that you first drill a pilot hole with a 7/64-inch or 1/8-inch drill bit to prevent the wood from splitting. A pilot hole is not necessary for decking boards as it will hinder wood expansion and its resulting concealment of the screw. When water is applied to deck boards, the expanding wood will almost totally conceal the hole. While the Counter Snap tool and screws are designed for both hardwood and softwood floors, the drill bit you use to pre-drill will depend on the type of floor. The easiest way to tell if you have softwood is to see if your fingernail can make a mark in the wood. If it does, use a 3/32-inch drill bit or smaller. The best way to determine bit size is to try it on an inconspicuous part of the flooring (perhaps inside a closet) and drive the screw down through the fixture. The screw should snap just as the head hits the fixture. If it does, you can use it on the rest of the floor. If it doesn't, then drop down a size on the drill bit to put more pressure on the screw. 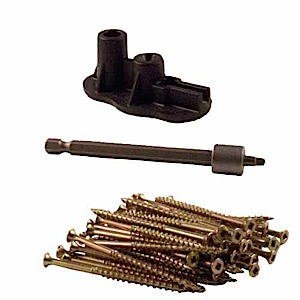 The Counter Snap screw fastening system is the solution if you have annoying squeaks in hardwood floors and stairs. However . . . think beyond squeaky floors and consider how the Counter Snap screw fastening system can make subtle repairs in furniture, wooden fences, or cabinets and be nearly invisible in trim work, wainscoting, baseboards, casing, and crown molding. Step 1: Drive Counter Snap screws through the fixture. Step 2: You will hear a snap as the screw head hits the top of the fixture. Step 3: Under stress, the screw snaps at the score and is countersunk 1/8 inch below the surface. Before using this squeaky hardwood floor repair kit, I recommend that you print this page for reference. The flooring kit was designed to get the job done—we encourage you to read everything carefully before using the kit. Don't get carried away and install screws all over the place. Just because the kit contains 30 screws doesn't mean that you should use them all in a concentrated area. Isolate the squeaks and determine the width of the squeak area. Then use as few screws as possible to stop the squeaks. This product has a great 10 years+ track record and is successfully used by DIYers and professionals alike. Customers who have called to tell us they were unable to get the kit to work or that the kit didn't work hadn't carefully read the Troubleshoot Before Using The Counter Snap Hardware Kit (above) or the Troubleshooting (below), didn't understand their floor's construction and/or how squeaks travel, or didn't know how to properly use a cordless drill. The main reason why a screw spins and will not snap or back out is because the screw's threads are in a void (space) in the subfloor or are not in contact with a solid framing member such as a floor joist. To remove the screw when it spins, grab the fixture and pull up at the same time as you back out the screw. Another reason why a screw spins is because the screw may have broken below the intentional score mark where the screw is supposed to break. It is the upper portion of the screw that will be spinning. Again, lift up on the fixture as the screw is being backed out. If a screw breaks prematurely, it is possible that a pilot hole wasn't drilled in the hardwood, the screw tip hit another fastener (nail, screws, or staple) in the subfloor or a knot in the subfloor or framing member (joist). Unfortunately, this can happen and it's not the fault of the product. To get the screw out place a locking piers on the remaining portion of the screw and turning the screw counter-clockwise to back the screw out.